Ah, the holidays. A time for spending money that you don’t have on people that you don’t like. Wait, what? The holiday season in the United States is a consumerist force to be reckoned with. A full month of urgent promotional emails, enticing sales, bright sparkly billboards, glossy advertisements, bell-ringing Santas and shopping bags bursting at the seams. Every retailer claims that the wares they’re hawking are “the perfect gifts” for the loved ones in your life, now for the low cost of $79.99! Meanwhile, you’ve got to figure out a way to make ends meet while traveling to and fro, indulging in festive get-togethers, and buying gifts for everyone on your list from Grandma to your coworkers. Then the whole season gets rounded out with mountains of single-use plastic packaging and wrapping paper that ends up in the landfill, not to mention the atrocious amounts of food waste we leave on our plates. I’m stressing out just thinking about it all. Every year I try to keep myself out of all that hubbub by asking for nothing and often avoiding holiday gatherings completely. But there’s no need to be a scrooge if you want to keep living your life sustainably during the holidays - it just takes a tad more creativity to find the perfect gifts that won’t waste your money, your time, or the planet’s precious resources. Don’t fall prey to flash sales, fancy ads or the endorphin inducing whirlwind that is holiday shopping. No, this year I challenge you to get thrifty and think outside the box when it comes to gift giving so that you can watch with pride as everyone on your list lights up in delight upon unveiling their special something. To help get your gears going, I’ve brought together some ideas for thoughtful, conscious gifts that don't require a trip to the mall or any kind of plastic packaging whatsoever. Stop and ask yourself about the person you are gifting. Are they into taking risks and constantly learning new things? Or are they chill with lots of self-care time? Think about whether they have any interesting goals or hobbies that you could feed into, or maybe if they're more happy with sweet gestures. Go from there! Make a date to get out of the city and challenge yourselves on an outdoor adventure! Snag tickets to a play, movie, or concert that you’ve both been wanting to see. Buy groceries (or a gift card to the store) and plan to cook a meal together in the near future. Sign them up for a candle making workshop in Brooklyn! Perfect for anyone looking to get in touch with their creative side. Get your budding home cook and/or obsessive foodie a vegan and health-focused cooking class at the Natural Gourmet Institute. Love the sound of this souping as juicing class! Book your spiritual yogi friends a unique workshop at a cool studio like Sky Ting in New York. Any sustainable fashion designer or fan would love to learn how to natural dye with one of my mentors, The Dogwood Dyer. Your friends have cool patch-laden jackets, too? Feed their obsession with these fun kits from Wool And The Gang! Or dive into natural dyeing yourself and use my avocado pit pink recipe to make a beautiful set of napkins, a silk scarf, a pillow case...whatever you can get on the cheap that will look really good in millenial pink. There are actually a lot of things that you can put in a mason jar and they’ll automatically taste better and feel special. Trust me, I’ve tried it. And so has Holly of Leotie Lovely! Just go and pick up a few of the best vegan-socialist-feminist-sustainable chocolates around and send them to anyone on your list. They’ll be happy. Send a gift card to a restaurant they’ve been wanting to try or to a cool one that you think they would like. My recommendations would be Dirt Candy for New Yorkers, Gracias Madre in San Francisco, and Cafe Gratitude in LA. Someone on your list have a socialist streak? Try a subscription to Jacobin Magazine ($5 off right now to celebrate their new edition!). Are they really concerned with climate change and losing wild places? They need Selva Beat! If they are dedicated to democracy, then I would choose the ACLU. Do they love the outdoors and fight climate change in their free time? 350.org is perfect. Are they passionate about women’s health and women’s rights? Give a gift to Planned Parenthood in their name. How about a nice potted plant? Perfect for adding color and cleaning the air in a city-dwellers apartment! Pick out something that is meaningful, beautiful, inspirational, and affordable: a crystal. This post is generously sponsored by Trunk Collective. Sustaining Life will only ever work with and promote brands that we believe in, so please support our work by supporting theirs, too! The holidays are something of a contentious time of year for anyone who does their best to maintain a sustainable lifestyle. Often turned into a time for sugary glutton and consumerist excess, the holiday season is frustrating when you are someone who cares about the size of their footprint on this earth or even just the health of body and sanity of home. You may be tempted to forgo gifting altogether - and I certainly couldn't blame you - but before you lock the wallet up for the month, first consider some gifting options that will make both you and your loved ones feel good. Gifting an experience, a donation in someone's name, a DIY zero-waste goody, or something purchased from a sustainable retailer are all excellent ways to stick to your values without insulting anyone by skipping their stocking this year! Especially when it comes to the women in your life who tend to be tricky - your boss, cousin, or entire group of gal-pals - something small, simple and sweet will do the trick. Think of their gifts as tokens of appreciation and a small expression of thanks for them being in your life. That small gift will be all the better knowing that it comes from an eco-friendly, ethically made, fair-trade and empowering environment. Since hunting down individual gifts that fall into this category and remain affordable is a bit of a challenge, Trunk Collective and I have gone ahead and done the hard work for you! Every item you'll find on Trunk Collective's easy-to-navigate website has been vetted and curated by founder, Karina Gonzalez. Many of the items have been sourced during her travels in Africa and Asia, and each one has a beautiful story behind it. On top of each item's unique tale, Trunk Collective makes sure that they give back with each and every purchase. This season, 7% of every purchase made will go directly to the U.S. Friends of the David Sheldrick Wildlife Trust, where your dollars will be used to rescue, care for, and reintroduce orphaned elephant's into Kenya's Tsavo National Park. Trunk Collective's support of these animals, and their carefully selected collection of treasures, serve as "a reminder that every piece has a connection to a much larger part of the world" and aims to inspire us all to make our purchases with pride. The following suggestions are some of my favorite, low-cost items from Trunk Collective. There's a little something for everyone, from your friend who travels constantly to your cousin who loves to pamper her skin and your aunt whose favorite place is her cozy home. Give the ladies in your life something that's just perfect for their busy lives without creating more useless stuff in their home, and give the added gift of the warm fuzzy feeling she'll get when she hears the story behind it. Get her this yummy grapefruit & mint body scrub by Revival. She'll love the feeling of cold-pressed coconut oil soothing her skin as the Himalayan pink salt and peppermint essential oil exfoliate and revitalize. Send along some dark chocolates and a handwritten note that encourages her to spend a relaxing evening in, pampering herself because she deserves it! Snag a bottle of this dreamy facial steam by Mullein & Sparrow. Made in the USA from 100% organic herbs and flowers, this little bottle will deliver relaxation and rejuvenation in just five minutes. Be sure to let her know where you got this one, because she's certain to be back for more! She'll absolutely love these understated yet glamorous gold bar earrings from Starfish Project. Let her know that you love or admire her style by sending something sparkly and versatile, something that she can wear with anything and that she'll treasure for years to come. Go for a bottle of deep ruby nail polish by Gloss, a beauty brand that is committed to non-toxic and vegan ingredients. If she loves the idea of adorning herself in gorgeous colors that won't harm her or the planet but just doesn't go for red, pick her favorite from any of Gloss' other luscious hues. Let her know that you appreciate her hard work & jet-setter lifestyle with this printed linen clutch by Urban Grey Whale. With original artwork printed in water-based inks, this fun & textured pouch can hold her cosmetics, pens & pencils, or a set of reusable utensils while she travels. It can even double as a standalone clutch for those days she's running off the plane and straight to a meeting. Give her this beach throw by Guadalupe Designs as a double-duty item for those tropical vacations she's always going on. Hand woven by artisans in India, this thin but sturdy throw will be perfect for laying out at the beach, keeping warm on the plane, covering up by the pool, or any number of on-the-go activities! Not only is it beautiful, but it will encourage her to be more efficient and sustainable by using just one item for a number of uses. Send her some warmth and cheer in the form of a fun, patterned indigo throw from Guadalupe Designs. The perfect gift for anyone who loves to stay home with a good book, this throw is hand woven by artisans in India and will brighten any room of the house. Get her this fragrant and luxurious bar of lavendar & french clay soap by Soapwalla Kitchen. Whether she keeps it in her own bathroom or puts it out in a pretty dish to impress house guests, something simple like a nice bar of soap will brighten her home down to the last detail. Help her keep it minimal by gifting the Billie wallet coin purse from Medusa. With it's tiny silhouette, sleek design and flash of gold, this little wallet will be her best friend on days where she needs to run from work to a classy event. 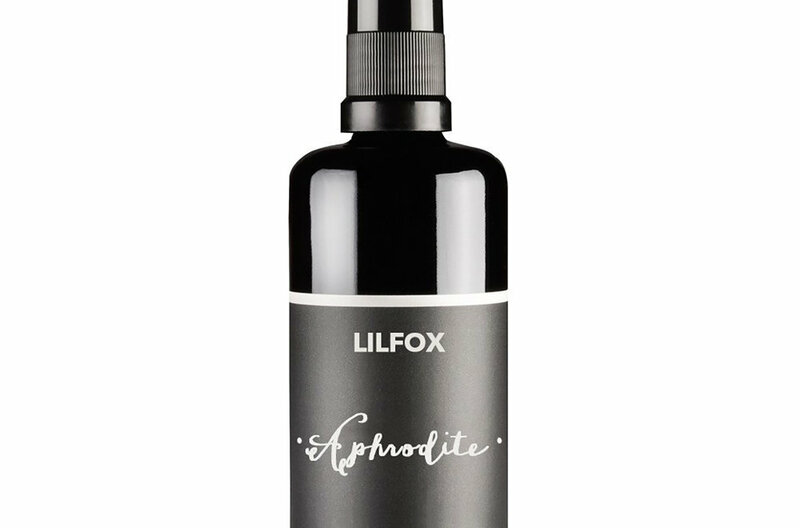 Give her the heavenly Aphrodite rose toning mist by Lilfox and she'll be ever grateful. This little bottle of sparkle and shine can live in her purse to be whipped out whenever she needs a quick refresh. With organic distilled rose essence and rose quartz crystals, the Aphrodite spray will feel truly luxurious on a hot day or in between activities.